When Terry McMillan burst on the scene in the early 90s, she gave readers the black girl magic they’d been looking for and didn’t even know it. Her writing gave birth to a whole generation of authors. For so long they had a story to tell and publishers were finally taking note. Fast forward 20 years and a new generation of authors has emerged on the scene. With her Morrow Girls series, D. Bryant Simmons is quickly proving to be a student of McMillan’s early work. How to Knock a Bravebird from Her Perch is the story of Pecan, a young woman born and raised in Hattiesburg, Mississippi by her father when her mother leaves town, and them, behind. Her father’s death when she’s a teenager leaves an already fragile Pecan susceptible to a smooth talker by the name of Ricky. With his dream of boxing professionally in mind, Ricky convinces Pecan to leave the familiar town and move to Chicago with him as his wife. It’s not long before Pecan realizes that she’s made a mistake in moving north to the big city, and while she might be able to adjust to life there, it’s difficult to adjust to the blows Ricky’s fists land on her body when the mood strikes him. Saddled first with one baby, then another and another, Pecan begins to believe that she’ll never get out from under the thumb of her jealous, insecure husband. Then salvation arrives in the form of Ricky’s aunt Clara. Aunt Clara doesn’t make everything better, but she does give Pecan the kind of maternal guidance and support that her life has lacked up until that point. With new found confidence, Pecan’s path is altered, as is the path of her daughters. 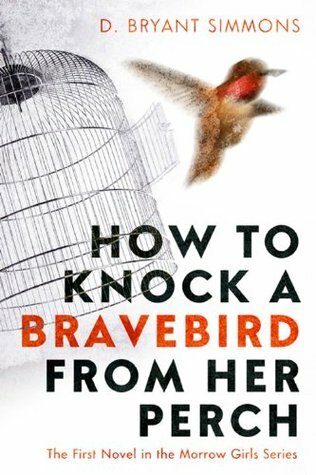 As I read How to Knock a Bravebird, I kept thinking to myself that I'd read it before. I knew the characters well already. I read Terry McMillan's first novel in college. I remember being blown away by her portrayal of Mildred, an emotionally stunted mother in a suburb of Detroit. It was just by coincidence that I happened to re-read Mama shortly after reading How to Knock a Bravebird and its sequel Blue Sky. The parallels between McMillan’s work and Simmons are clear. While Pecan is in Chicago, Mildred is, for a long period of time, in Detroit, cities that drew African Americans during the Great Migration. Both women find themselves with men that look good, but are no good for them. They also mother children that they’re unable to nurture because they’re too busy trying to figure out how to survive themselves. We see them move on from those men and continue to make bad decisions because the lessons they should have learned still haven’t been. And we witness the effects of their bad decisions on their children, the majority of whom are girls, continuing the cycle in future generations. There’s no doubt that McMillan has heavily influenced Simmons. As much as I enjoyed How to Knock a Bravebird and Blue Sky, it’s my hope that Simmons finds her own voice soon so readers can enjoy her authentic work, not re-hashings of someone else’s voice. After all, there is only one Terry McMillan, and though she tells a hell of a story, there are more stories to be told and Simmons should focus on them.